Navy Secretary Ray Mabus said he’s confident the sea service is taking the right steps to get its ship maintenance back on track, after a Government Accountability Office (GAO) report noted declining material readiness of Navy ships and particularly those homeported overseas. Speaking at the American Enterprise Institute on Tuesday, Mabus said that whereas the Army and Marine Corps can come home and “reset” after periods of war, the Navy maintains its deployment schedule in times of peace and therefore has to reset in stride. He said former Chief of Naval Operations Adm. Gary Roughead made progress improving the condition of the surface combatant fleet, and the Navy is currently implementing an Optimized Fleet Response Plan (O-FRP) – a 36-month cycle for maintenance, training, deployment and “surge” status – to help the entire carrier strike group and other surface ships. 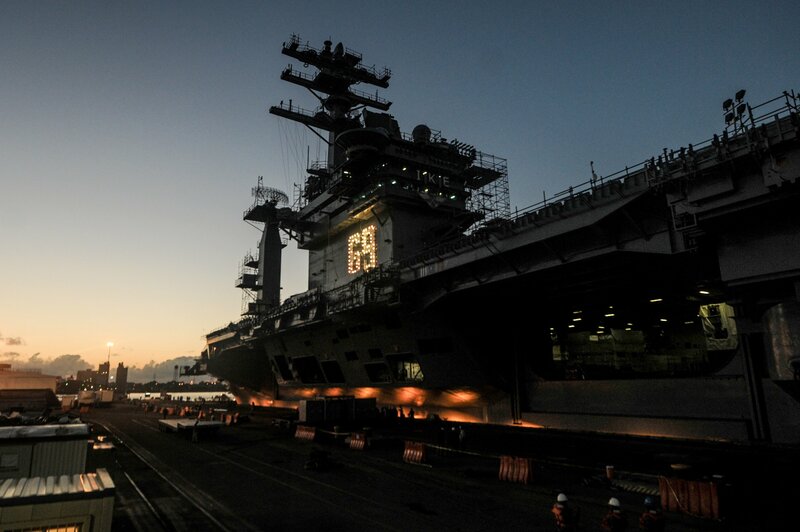 “One of the issues we’ve got, because our deployments are getting longer and because they’re being extended, when they come back they don’t have enough time to reset, to do the deep maintenance that you need to do,” Mabus said. GAO noted in its May 29 report, however, that O-FRP may not be enough. “The Navy began implementing a revised operational schedule in 2014 for U.S.-based ships that lengthens time between deployments, citing the need for a sustainable schedule. However, the Navy has not determined how – or whether – it will apply a more sustainable schedule to all ships homeported overseas,” the report notes. For both ships homeported in the United States and abroad – in Japan, Bahrain and Spain – the number of casualty reports, which detail “degraded or out-of-service equipment,” has doubled over the past five years, with the material condition of overseas-homeported ships declining more dramatically than those homeported in the United States, according to GAO. Though the Navy says homeporting one ship abroad creates the same overseas presence as four ships homeported in the U.S. – to to transit time and differences in the training and maintenance schedules – GAO says the extra presence comes at higher operational cost per ship, decreased crew training, lower material readiness and eventually shorter ship service lives. “Overseas-homeported ships are maintained differently than those homeported in the United States, which has led to maintenance deferrals and higher maintenance costs,” according to the report. In 2006, the Navy had 20 ships homeported overseas, or 7 percent of the fleet. By the end of the summer, the Navy will have 40 ships homeported overseas, or 14 percent of the fleet, according to the report – 21 in 7th Fleet, in Yokosuka and Sasebo, Japan; five in 6th Fleet, in Gaeta, Italy, and Rota, Spain; and 14 in 5th Fleet, in Manama, Bahrain.